Kai & I in late May 2011, in the midst of building our Tiny House. Sorry for the delay in travel updates but as I mentioned in our last post, we’ve been taking time to assess whether or not we’re still on the right track. The occasional review of our goals helps us to stay focused and to live with intention. It also gives us an opportunity to check in with each other and to make sure we’re both feeling fulfilled and happy with the direction that we’re headed. Before we talk about future goals we always take a look back at how much we’ve accomplished and how far we’ve come. It helps us to feel less overwhelmed by the future and it’s often a good reminder of how powerful and successful we can be. It’s hard to believe that last year around this time we were still giving away our stuff and only into the third and forth week of building our Tiny House. I laugh when I read our blog entries from last June, when we actually thought we only needed a “couple more weeks” to completely finish building the envelope of the house! Wow, were we ambitious (read: naive)! Little did we know it would take another four months! We just celebrated our eighth month on the road! 🙂 What originally began, years ago, as a fantasy of escapism and a “vacation” from everyday tedium, has since morphed into a new way of living. As just one part of a larger plan to redefine the way we live, our travels by bicycle have taught us many lessons. We’ve never been more aware of our bodies’ needs (and aches!) or more amazed by our bodies’ capacity to carry us around the world. We’ve never been more aware of how precious each resource is. Food, water, fuel – conservation becomes a priority when you have to carry them over mountains! We’ve never been more aware of the earth, the stars or the living beings around us. And we’ve never been more aware of how both vulnerable and powerful we all are. Our relationship with each other and the world around us has become more intense. It appears that once we strip life down to the basics, we can no longer hide behind distractions. We are forced to become better communicators, to be humble and to show more respect for each other. People we meet, time and time again, prove we are a generous and kind species, yearning for connection. It is strikingly clear that everything and everyone is interdependent. And that has made us more aware of our responsibility to maintain healthy balances, both on a personal and a global level. 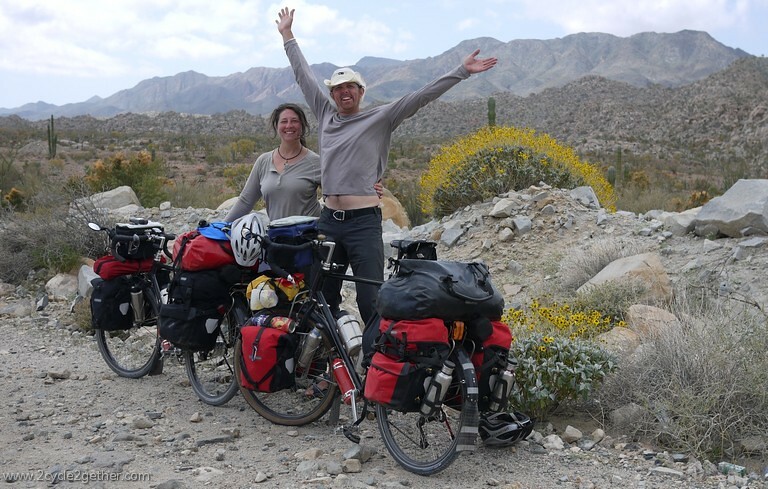 Although bicycle touring offers many challenges and benefits that we love, the general dynamics of long-distance touring (riding all day, physical exhaustion, constantly packing and unpacking gear, finding food and water, setting up camp, making dinner, etc.) often leaves us with little energy at the end of the day to devote to other interests. That can be a problem, as we’re not just in this to simply ride our bicycles. We’re in this to become more engaged world citizens, to meet others who are addressing global issues that affect our future, to learn new skills that will help us live in more sustainable ways and to find a community of like-minded people who are facing our collective low-energy future with hope and a sense of urgency. We still feel that cycling is integral to our journey and we have no plans to stop. But as we cycle we’re trying to work out a schedule or rhythm that allows us time to devote to people and projects that are important to us. We’ve been traveling at a much slower pace than we originally intended. It’s been wonderful to just relax after going non-stop for the last five years. Our original plan was to give ourselves at least six months to focus only on riding and acclimating to our new lifestyle. Now that we’ve adjusted to bicycle touring, we’re ready to start integrating additional projects into our travels. It should be of no surprise to anyone who follows our blog that we’re very concerned about environmental and social justice issues and our collective future. We believe that our daily choices affect the world in profound ways, which is why we’ve so drastically changed the way we live and why we continually work toward making better choices. We have a lot to learn and we need to build skills that will be helpful to us and our community in the future. There are so many people in the world who can teach us new things or that can give us inspiration and hope for the future. One of our goals is to connect with these people as we travel. Another goal is to dedicate a significant amount of time and energy to causes and issues we feel are important and to become part of a larger community. We will do this through a variety of means: volunteer or humanitarian work, research and reading, coverage of important events or issues via our blog, writing public letters, practicing daily activism and more. If it means we need to stop for long periods of time to be able to devote our time to a project or a community we will do so. Of course, we will continue to blog about cycling and our travels. I find it personally fulfilling to write about our experiences. It offers a unique opportunity to reflect upon what we’ve experienced and to realize valuable lessons. It also helps me appreciate how incredibly blessed we are to be living this kind of life. Our cycling route is being planned in a way that will help us to meet the goals above. We will stop for volunteer or workshop opportunities as often as we can so that we can learn as much as possible while we’re out here. For instance, we plan to cycle through the city of Oaxaca, Mexico, and will take a break there in order to volunteer with a couple of organizations we think are doing spectacular work. In Guatemala we will stop again to volunteer and to take Spanish language classes. We have similar stops planned throughout the world. We will share our experiences and what we learn with you via this blog. We’ve decided to write a Tiny Book about our experience building a Tiny House. Our goal is to include all the practical tidbits and details we didn’t have time to cover on our blog as well as to tell our personal story around the tiny house movement. Depending on timing, we will most likely take a break from the road to complete the book later this summer. TurnAbout Series :: This series will feature opinion pieces, by us or by guest writers, about current and critical social or environmental justice issues. “TurnAbout” posts foster new ways of thinking about our collective plight, spur community discussion and/or offer up radical solutions for worn-out “problems”. TurnAbout :: Alternatives to Banning Urban Camping was our first post in this series. Galvanizing Hope Series :: The Galvanizing Hope series will highlight ideas, individuals or organizations that strengthen our hope in our collective future and that represent our ability to achieve great things, both as individuals and as a community. The first post in this series, coming soon, will cover the Restorative Justice movement and Sujatha Baliga’s inspiring work in the field. Illumi-Linking Series :: The Illumi-Linking series will be a collection of short posts containing links to books, blogs, articles and/or quotes that inspire or challenge us. So that’s what we’re up to. What do you think? Do you have suggestions for people, groups or organizations (non-religious affiliations only, please) that you think we might want to meet or give our time to? We’re especially interested in grassroots movements or average people who take it upon themselves to initiate change. Do you know of workshops or eco-villages (not of the “eco-tourism” kind) that offer classes or workshops we might be able to benefit from? We’re interested in anything related to sustainable living – food, water, energy, housing, community-building and much more……our list of things to learn more about is long! Do you have suggestions or ideas for a topic that could be covered in a TurnAbout Series? Do you know of someone or an organization that we should cover in our Galvanizing Hope Series? Please don’t by shy – contact us with your ideas! Is there something in particular you would like to know about our Tiny House experience? Let us know and we’ll make sure to include it in the book or on our website. I believe that you are privileged to “get it.” The rest of us who have not taken the steps to strip live down to the basics, as you say, can (at best) read and nod in agreement. I try to take tiny steps, though. Journal. Prioritize. Be still once in a while. Choose my heroes thoughtfully. Keep up the blog, and be well. You are among my heroes. I’ve been so grateful for our recent correspondence with you. You’ve been immensely helpful to us over the past few weeks. I still plan to respond to some of your most recent emails/thoughts during our next break from the road. Till then, be well! I’ve much enjoyed reading about your travels and your perspectives. I write for TreeHugger.com, mostly about sustainable transportation, and I’ve been contributing to this site for nearly five years. In that time, an incredible amount of posts about different eco destinations have been written. Many of these will be more about the resorts and less the sustainable villages – however, with the huge breadth of contributors we’ve had, I think you’ll find it a great resource for finding these places around the globe. I’m not sure, though, which set of search terms will get you the greatest number of hits. I guess you’ll have to play around with it on the site. April, you are awesome! Thanks so much for your recent link to 2cycle2gether in your article about National Bike Month and for writing about sustainable transportation. And thanks for the suggestion on finding sustainable villages via TreeHugger.com. We’ll be sure to take a look and see what we can find. ALSO, forgot to say I’m loving your site GirlsonBikes, especially your most recent post Just Decide to Ride . Thanks for all you do! Y’all have my support! I think what y’all are doing, have done, and are planning to do is just incredible. I enjoyed watching your house be constructed and I have enjoyed your occasional checkins while on the road. It does my heart good to know that y’all have loved every pedal of the way! Be well. Thanks Andrew! It’s means a lot to us that you’ve always been so supportive. Wishing you continued success in your own endeavors (that tiny house is getting better every day!). I think this is a wonderful direction you are turning with your site. As often as it happens on a bike, the best path to take isn’t always the most direct one. In short, you are now looking for the roads less traveled and reporting back to us of those. 1) Pictures, pictures, pictures. The locals, the festivals where you two participate with whatever community you are in, the food you are learning to make, and the shots of you two on the bikes. 2) The discussions of what you are seeing first-hand of how communities work and what is impacting them. Kai got me to spend over a half hour researching sand transport costs just because I had to know if my state was exploiting another community just to save a buck. I was compelled to get involved, and I thank him for that. 3) The innovative solutions. Some you highlighted as you’ve noticed them along your way. Others you have championed yourselves, such as the rainwater recovery system you guys delivered to a local school. I had a friend that I used to bicycle with. We would go breakneck speeds everywhere. Then one day, we were flying from point A to B, and he just stopped dead — I had to swerve to keep from hitting him. I looked back with a nasty scowl on my face and I saw him leaning over a fence to smell some roses on a bush in someone’s garden. I was too focused on how I was getting to where I was going that I forgot to enjoy the journey. Enjoy your journey. Stop and smell the roses and marvel at the wonder that is the human race you meet along the way. Listen and learn, teach and participate. I’m excited to live vicariously and encourage you guys to keep this up. Thank you! Thank you! Thank you, Jeremy! It’s so great to hear what you enjoy about the site and helps us to understand what makes a difference to you and others out there. You have no idea how much your response in #2 excited both of us – it gives us hope that you were compelled to get involved (thanks for that). Thanks for your supportive words. We’re glad to have you along with us on this journey. Sheila and Kai, you are inspiration. Nothing to add or change at this time. Please just keep doing what you are doing and trusting the road (and your good hearts) to lead you well. Your journey keeps my eyes open to the possibilities.